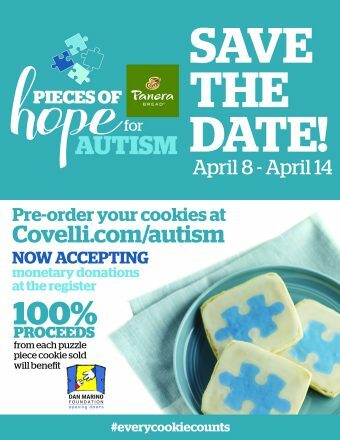 Covelli Enterprises, the largest franchisee of Panera Bread, is once again partnering with The Dan Marino Foundation (DMF) to celebrate Autism Awareness. Starting Monday, April 8th through Sunday, April 14, Panera will sell one-of-a-kind ‘Pieces of Hope for Autism’ cookies, which were specially designed to represent the symbol for autism and will be sold in all 31 cafes in Broward County and Palm Beach Counties in honor of World Autism Awareness month. 100% of the proceeds from all ‘Pieces of Hope for Autism’ cookie sales will be donated to DMF. Since 2010, Covelli Enterprises has donated more than $2 million in the areas it serves to support various autism organizations, schools, and centers in providing services, scholarships, research, treatment, advocacy, and resources for families. We pride ourselves on being in our 9th year of partnership with The Dan Marino Foundation – they are the pioneers of helping people with autism and learning disabilities in South Florida. The puzzle piece cookie consists of Panera Bread’s famous shortbread topped with sweet white icing and an edible sugar decal and is made entirely free of any artificial colors, flavors, additives or preservatives. Panera Bread will also be collecting funds in all thirty-one (31) bakery-café locations through their Operation Doughnation boxes located next to the registers at each café now through May 31, 2019. “We’re proud to once again partner with Covelli Enterprises – Panera Bread for the 9th year. Our Foundation appreciates their leadership in showing acceptance and their generosity in giving back to the autism community. Every cookie purchased makes a difference. The ‘Pieces of Hope for Autism’ cookies are the best, just like the Panera Bread team that bakes them,” said Dan Marino, Chairman of The Dan Marino Foundation.